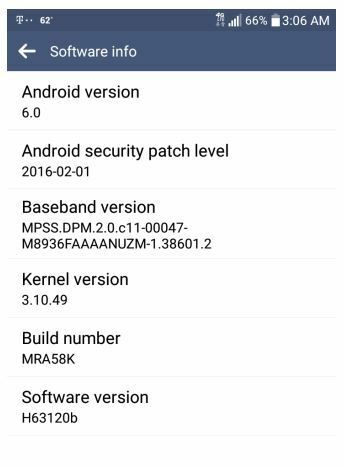 The LG G Stylo has been receiving Android 6.0 Marshmallow update in the United States for the T-Mobile variant. The update comes with the latest Android version, security patches from February, a new firmware build, and the software version as H63120b. The 20b firmware is the incremental update over the Android 5.1 Lollipop H63110l. The incremental OTA brings several bug fixes, security patches, and all the Marshmallow goodies like App permissions, doze mode, new Emojis, etc. Following the deployment of Android 6.0 Marshmallow update on T-Mobile LG V10, and the T-Mobile LG G3, the US carrier has released the official update to the LG G Stylo H631. This latest Android 6.0 update comes to us with the full LG KDZ file and a TWRP flashable zip file. So if you have not yet received the update over-the-air or you have rooted your device and want to revert back to stock, then this guide will help you get your T-Mobile LG G Stylo H631 to Android 6.0.1. Check out the screenshots, downloads, and firmware information from below. A similar update is also available for the G3 D850 AT&T variant of the device with 30K firmware. Note: According to a Metro PCS user, you can also use this KDZ on the LG H631 and the LG MS631 variants as they are both the same devices essentially, same exact hardware on the same exact network. However, you should be cautious about it and we won’t be responsible for anything that happens to your device. If you are looking forward to installing the Android 6.0 Marshmallow update on T-Mobile LG G Stylo, then there are two methods for it. First one is using the LGUP tool that requires the Full stock KDZ firmware as listed in the first link. Head over to this tutorial for detailed explanation: Update T-Mobile LG V10 To Android 6.0 Marshmallow H90120E With LGUP. There are two methods listed there. The second method is a TWRP flashable zip file Refer this tutorial: How to Install Stock Android 6.0 Marshmallow On LG G3. Alternatively, you can also install it using the LG PC Suite as shown in this discussion. In order to root the stock Android 6.0 update, make sure you have TWRP setup and then flash the latest SuperSU build or the AutoREC for the T-Mobile LG G Stylo. Like and follow us on social media. For queries, comment down below or leave a message in the forum.